Mostrar is a city in the Federation of Bosnia and Herzegovina. In Mostrar, I walked by many building frames that had been hollowed out in a 1993 attack during Yugoslavia’s civil war. One had a sign warning of danger if you were close enough to read the sign! There are many tourist shops in this town of approximately 100,000 people. Emblematic of the recent internal strife, a high church steeple and a cross were placed on a hill to be taller than the local mosque minarets. 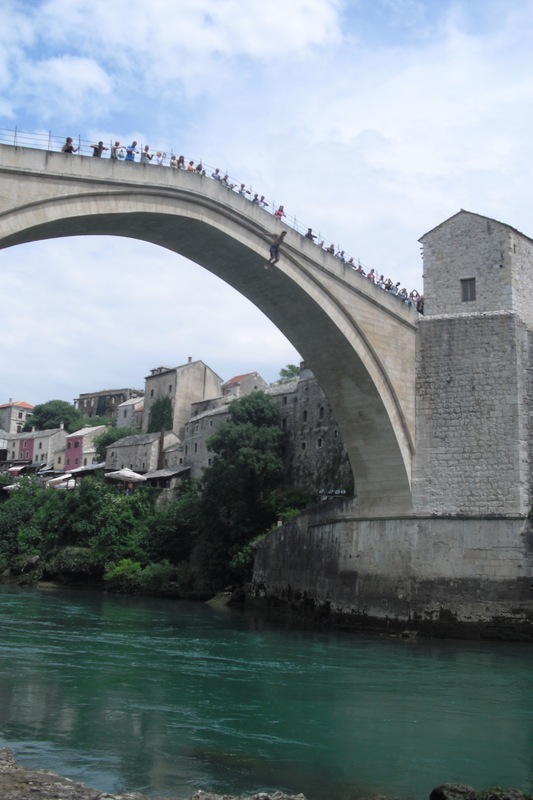 In the city museum, video footage shows how its famous bridge, the Stari Most, built by the Ottomans in the 1500s and spanning over the Neretva River, was bombed until it was no more. The bridge withstood a lot before shattering in that 1993 bombing. A bridge was later built at the same point over the river. If I paid 25 Euros, I could be trained to get approval to jump from this very high bridge. I didn’t. But I did watch an Australian man and then an English man jump from the bridge into the river. That was exciting enough.